In the framework of this programme, several students from the Web Rangers team in Sci-Tech Rabin, Gan Yavne, lead the “Junior Web Rangers ” initiative in the local Ben-Gurion Primary School, under the supervision of teacher Tzviya Cohen. This initiative aims to introduce younger students – as early as primary school – to the principles of safe Internet use, and to nip cyber-bullying at the bud. 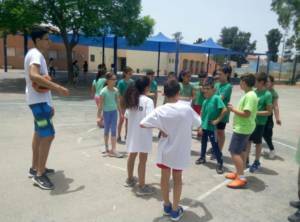 During the school year, students of Sci-Tech Rabin – Linoy Khalifa, Ital Lev, Nadav Tzadock, Guy Khalifa, Roee Gambiel, and Shaked Wahaba – facilitated topical activities to fourth-graders in the Ben-Gurion Primary School. At the beginning of the year, the high-schoolers did various activities with the younger students, to introduce them to the subject. During the year, the senior Web Rangers involved the fourth-graders in designing a range of activities for the school’s third grade. The older students instructed the juniors how to run the activity in the classroom in an interesting, original, and unique way. The students then produced a peak event on the topic of Internet Safety for the whole fourth grade. This peak event was co-designed by the high-schoolers together with several representatives of the fourth grade. The students discussed among themselves the types of activities and their contents, the event’s schedule and administration, role assignment, and so forth. The event itself was led by the fourth grade representatives, with full support and assistance of the Sci-Tech Rabin Web Rangers. The Sci-Tech Rabin “Juniors” conclude that it was indeed an amazing experience, which made a positive social contribution. Instructing the younger students gave them a lot of satisfaction, as did their contribution to the safety of the younger generation logging into social media.